One of the funnest recipes and the most requested my brother is Bacon and Cheese Mummy Dogs. They take no time at all and only have 4 ingredients and your done! I love how you can transform your Halloween treats with delicious recipes from Pillsbury including Crescent Mummy Dogs! Mummy dogs are quick and easy to make, and sure to please all the kids at home, or even the whole neighborhood. The recipe is great for larger Halloween parties, or simply at home with your kids to bring some excitement to the days leading up to Halloween. Follow our recipe below to put the Mmm in Mummy! To find more recipes like the one below be sure to check —HERE! Open Pillsbury Crescent Rolls and roll out flat sealing the perforations in the dough. With knife cut small slices all the way down the dough. You need that for wrapping your Mummy. Dry Hot Dog. It makes it easier to work with. Wrap Pre-Cooked Bacon around the dog working from the bottom up. Place cheese on front of the Hot Dog. I work mine with my fingers to hold on Bacon. Starting at the bottom of your bacon and cheese covered hot dog wrap Mummy Style. Leaving room for the face of the Hot Dog to be open to add eyes. Wrap any way you want too. I like adding enough to cover my cheese so it doesn’t melt out. Bake 15 to 20 minutes at 375* until golden brown. Remove to plates. Let the kids add eyes. A fun eye is small rounds of cheese cut out in circles and a ketchup drop center. Right now Publix has a wonderful deal on Pillsbury Crescent Rolls. Exclusive savings at Publix help with all the ingredients you need to make your Mummy Dogs like Pillsbury Crescents. 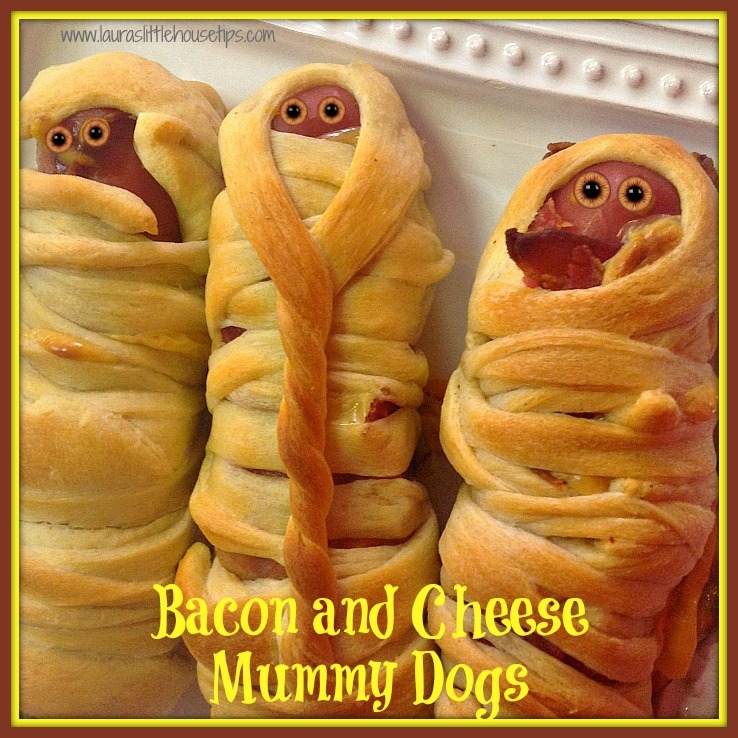 Making it Frugal to create your Mummy Dog recipe and Halloween party ideas. We also have a another fun Halloween Idea for you. Simply Enter Below for a $10.00 PayPal Gift Card making this a Super Fun Halloween. No purchase is necessary to enter. Void where prohibited by law. The odds of winning are based on the number of entries received Open to US Residents, 18+ only. Limit one entrant per household. Confirmed Winner(s) (by Random.org) will be contacted by email. Winner(s) have 24 hours to respond before a new winner is chosen. No purchase necessary. Void where prohibited by law. Lauras Little House Tips will be responsible for product shipment to winner(s) of this giveaway. My blog is responsible for product shipment/delivery. This event is in no way administered, sponsored, or endorsed by, or associated with, Facebook and/or Twitter, Google, Pinterest, Instagram or Klout. This disclosure is done in accordance with the Federal Trade Commission 10 CFR, Part 255 Guides Concerning the Use of Endorsements. Entrants must only enter with either one email address, IP address and/or Facebook account, anyone found violating these rules will be disqualified. It is at the sole discretion of the admin of the giveaway if the winner has met the rules or not.